I still had the "Dandelion Wishes" set sitting out and I ran across this fun card on Pinterest. I said it's fun because I got to sponge on colors. I LOVE sponging. The base of this card is a folded half-sheet of Whisper White card stock. On top of that is a 2-3/8" x 5-1/2" piece of Basic Black. The focal piece is cut 2-1/8" x 5-1/2". I sponged on Daffodil Delight ink and covered the entire piece. Then I added a 3/4" circle using repositionable tape. I sponged over the upper half using Crushed Curry ink. I then sponged the bottom half using Pumpkin Pie ink. I covered the whole thing with Daffodil Delight ink first because I didn't want the next two colors to saturate the card stock as much. If I had not added the Daffodil Delight ink first, the Pumpkin Pie would have been SO much darker. I wanted to keep it light. The words are from the "Better Together" set. 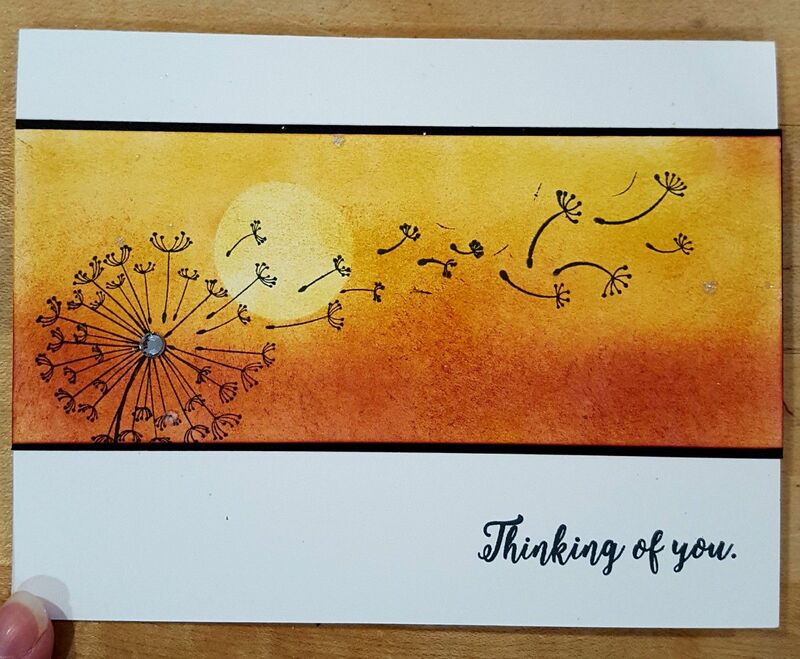 The original card was a thinking of you card. I don't know what set was used for those words, I did like the font but I didn't have it, so I thought I would use the "With Sympathy" words from the "Better Together" set. I think it looks nice. I think this image makes a great sympathy card. It's a very easy card to make. I taped the two layers together and taped them to the card front. And that was it!!! Easy peasy!